PORTLAND, Ore. — When Roy Rana, who is Indo-Canadian, told his mother he wanted to be involved in basketball, she thought he was crazy. Rana has exceeded even his wildest hoop dreams. The head coach of the World Team at the Hoop Summit, which takes place Friday night (ESPN2, 10 p.m. EDT), is also a candidate to become the head coach of Canada’s men’s national basketball team when it competes in the 2019 World Cup in China. Jay Triano, who is an assistant coach with the Charlotte Hornets, stepped down as Canada’s head coach in March. Rana was one of three coaches who took turns leading Canada during its World Cup qualification and was the first coach of color and Indian descent to lead the national team. He said he was interviewed for the head-coaching job during a recent two-hour phone conversation with team president Glen Grunwald and general manager Rowan Barrett, who is the father of Duke’s R.J. Barrett. They are expected to hire the next coach soon, a source said. 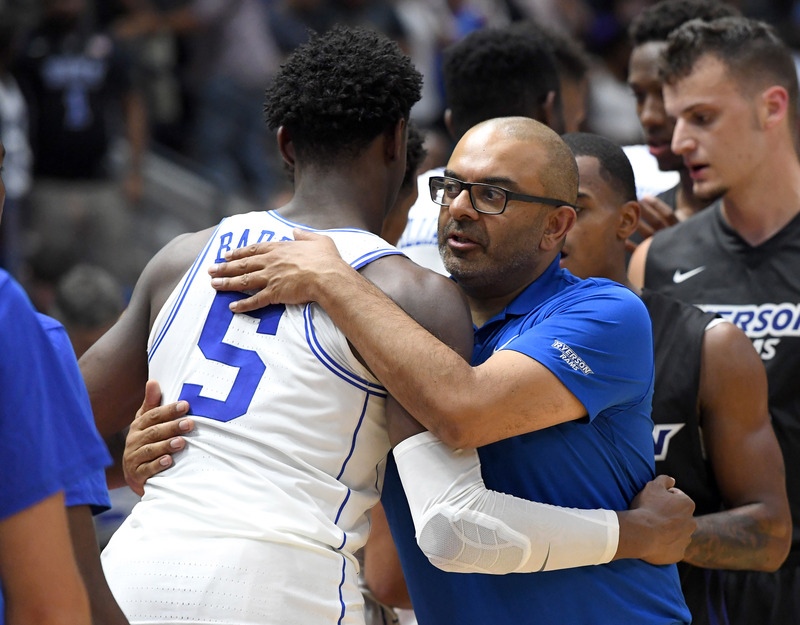 Duke University forward R.J. Barrett (left) embraces former coach and current Ryerson University head coach Roy Rana after a preseason exhibition game at Paramount Fine Foods Centre in Ontario. The name Roy Rana probably does not register among most ardent basketball fans in the U.S. But it does in Canada. Rana was born in Wolverhampton, England, on Dec. 8, 1968, to parents from Punjab and Uttar Pradesh, India. At 9 months old, his family moved to Toronto. His parents split shortly afterward, and he was raised primarily by his mother. Rana became a huge fan of the game of basketball in the fifth grade. Rana was a starting point guard in high school but didn’t play in college. He considered becoming a diplomat or a journalist in college before settling on a career in education. After college, he ran a program for at-risk kids and started coaching high school basketball at C.W. Jefferys Collegiate Institute. In 2000, he became the head basketball coach at Eastern Commerce Collegiate Institute in Toronto, where he would become one of the most decorated high school basketball coaches in Canadian history. A four-time Canadian High School Coach of the Year, Rana finished six of his nine seasons with the No. 1-ranked team in the country. Currently the head coach at Toronto’s Ryerson University, Rana led the Rams to their first conference title in school history in any sport during the 2015-16 season and won again the next season. He has a 116-53 career record with Ryerson and has guided the program to five of its six national championship appearances. “It’s an unbelievable ride for sure,” Rana said. Rana has also coached Canada’s junior men’s national team for five years. Under him, Team Canada won a gold medal over the United States in the FIBA Under-19 Basketball World Cup. It was the first championship for Canada in any international FIBA event. Through that Team Canada experience, Rana has coached every Canadian player currently in the NBA, including Andrew Wiggins, Jamal Murray, Tristan Thompson and Cory Joseph, as well as Barrett, a top draft prospect. Canada can become one of the biggest threats to USA Basketball in international competition. While age and experience are concerns, Rana believes Canada has “Top 5” talent. Murray said Rana would be a “great” choice to coach Canada because of his connection with the players. Rana has also earned respect from USA Basketball, which selected him to coach Team World at the Hoop Summit for a ninth straight year. He has coached All-Stars Karl-Anthony Towns, Joel Embiid, Nikola Jokic and Ben Simmons with Team World, as well as numerous other drafted players. The World Select Team is 4-4 under Rana and 3-10 without him. World Team forward Matthew-Alexander Moncrieffe, who is from Ontario, said he has learned a lot from Rana this week during practices. “He is a really good coach. He can get into you at times, but you have to find a way to learn not to take it personal because he is giving you really good information about motor and things that matter,” Moncrieffe said. “If you do what he says, you’ll notice an improvement right away. He has given me a lot of good tips so far. About 4% of Canada’s 37 million people are Indo-Canadian, with the numbers in Toronto and the Greater Vancouver areas at 10%. Rana, who has traveled to India extensively, hopes his success will inspire not just Indo-Canadian kids but all kids from backgrounds without a strong basketball influence. “I hope it’s not just about Indians,” Rana said. “I hope it’s inspirational to people who are not from typical communities that excel in the game. I was a high school basketball player that didn’t excel beyond high school. I’m a high school teacher who became a pretty successful basketball coach. As for Rana’s mother, who passed away in 2016, she learned to embrace the path her son chose.